I have a list fetish. I feed it in my ever-present notebook. Shopping lists, reading lists, lists of places to see, people to write to and on and on. When you combine both, you end up with a bucket list. Not for everything but for ‘big’ occasions. Like I had for my first New York trip. At the beginning, the ideas and thoughts flit about in your head, and then something happens, like in a game of cricket. The ideas get hurled towards you, some connect with a club, others go off base and in the end, someone, something emerges triumphant. 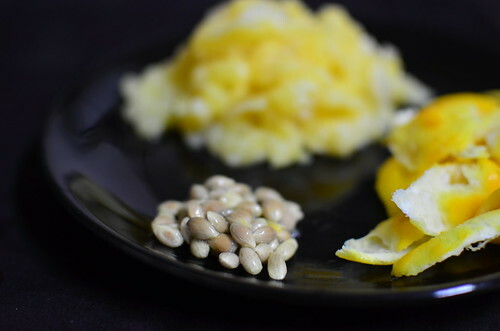 Meyer Lemons are everything Key Limes aren’t – plump, juicy, sweet and altogether tart. But for a moment, I thought that Key Limes were the juicy darlings of the lime world – alas, a meet with their tiny, juiceless bodies has left me joyous – that my Meyers remain uncontested in their beauty and juice. 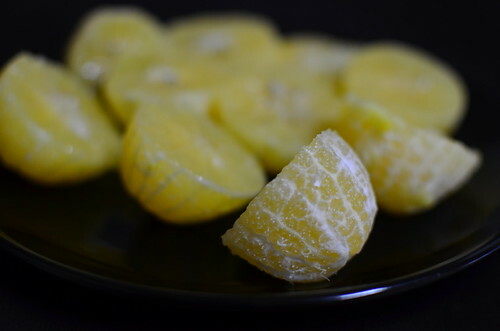 Meyer Lemons are believed to be a cross between a mandarin orange and your good old regular lemon. They are named after Frank Meyer, an employee of the U.S. Department of Agriculture who brought the fruit to the United States in the early 1900s, after discovering them in China. So why do we love the Meyer so? The fruit, the whole fruit and everything but the seeds are edible, and are in season from November till April! Yes, edible. Can you imagine all of the tang, and fruitiness of a citrus with none of the characteristic bitterness that lurks beneath the surface of almost every citrus skin and rind? But that’s not all, sniffing a Meyer is bound to transport you to blooming citrus gardens in the Middle East where floral scents akin to ‘rose’ water and orange blossom abound. That scent in a citrus is probably one of the most captivating things for me – heady, causing me to swoon in delight and admiration. 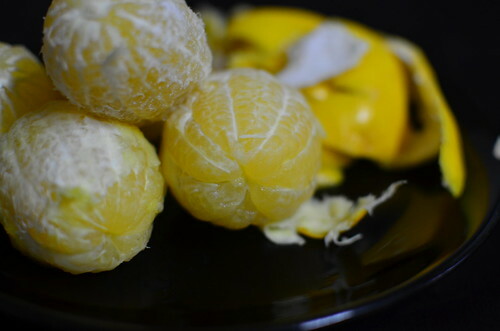 Meyer Lemons resemble similar-sized, softer versions of the regular (Eureka) lemons, only ‘yellower’, the colour of a fresh ‘egg yolk‘. I’ve seen photos of rounder, more mandarin-shaped Meyers but those that my eyes have beheld are more lemony-shaped than orange. 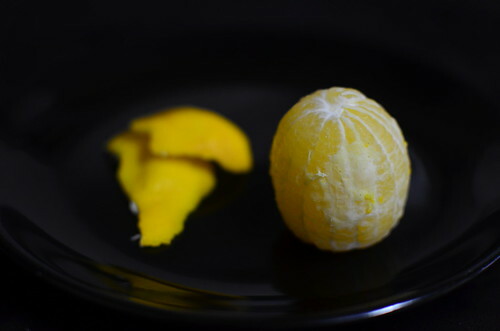 Like a mandarin, Meyer lemons are easy to peel – no knife required. The skin is bright yellow, with a light orange cast – a testament to its genealogy. Due to their delicate skins, Meyers aren’t imported in many places for fear that they would be damaged in the transportation process. I have had mixed experiences zesting my Meyers. Some have been easy to zest…. 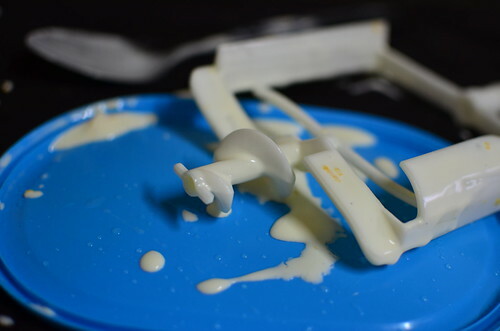 …..and the zest has fulfilled many purposes. 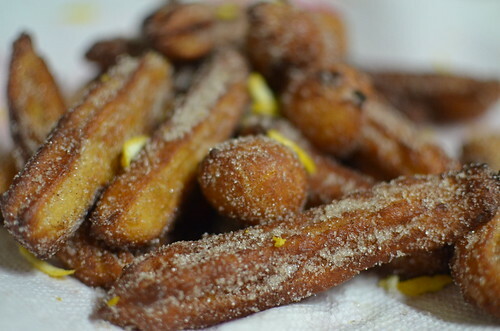 Cakes, Churros…. 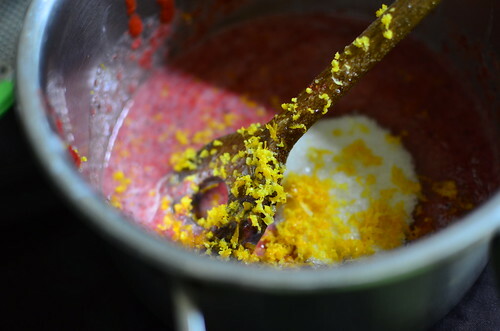 …..and lemon curd two ways – with lemon only and combined with strawberries. 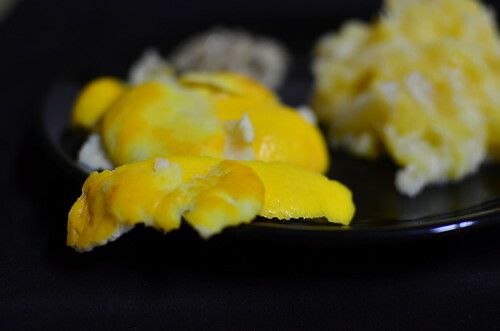 Some lemons weren’t easy to zest – too soft, too tender skin. 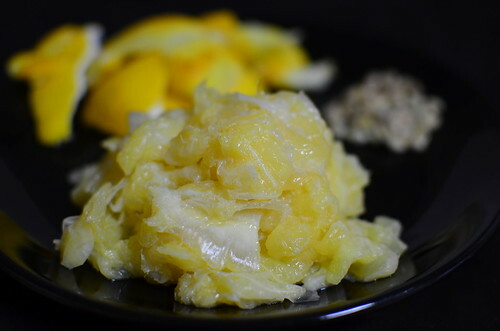 That hasn’t deterred me, for what I haven’t been able to zest, I’ve ‘preserved’ in kosher salt in not so typical ‘preserved’ lemons. 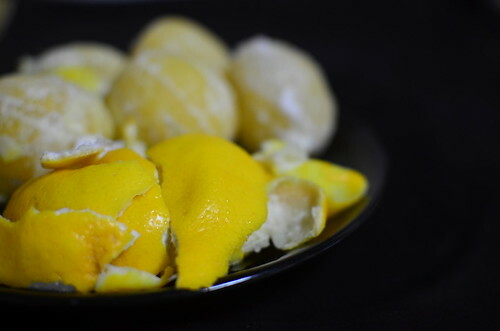 I call them Preserved Meyer Lemon Skins. The thick pith one is accustomed to in most citruses is thin in the Meyer. Just like it is in Mandarins, leaving small strings in its place. This is the the thing that most makes it ‘edible’ for generally, pith is mostly bitter. 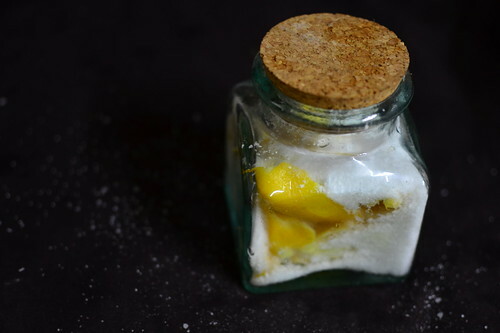 With it absent, the Meyer can be blitzed whole so one extracts all of the lemon essence, with only a welcome hint of bitterness. Just like that Guinness caramel sauce. How do you separate flesh from juice in describing a Meyer? Oh well. 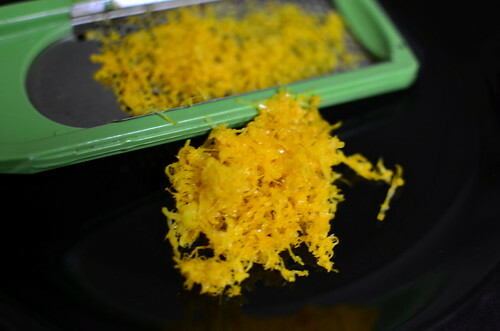 I will, for when I am done juicing the Meyers, there’s still pulp left – soft, juicy and usable pulp. I save it. The flesh is tasty. Lemony. And yes, I am repeating myself. 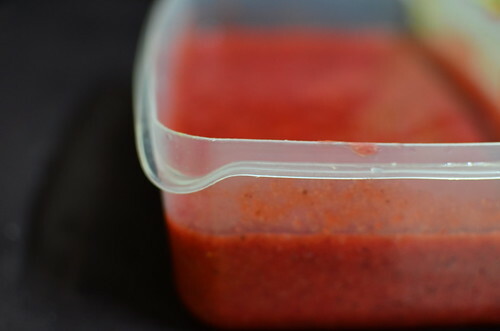 Some of the leftover pulp gets blitzed with strawberries to make the delightful River Cafe Strawberry Sorbet and this time it is super stunning – sweeter, more fragrant than ever before. For I am at a unique intersection not many people get. A junction that is the Nigerian strawberry season and the North American Meyer. And though I can’t be in two places at the same time, I am certainly enjoying the best of those two worlds. Oh, the juice. Nectar from citrus heaven. Light, floral, fragrant, and still tangy. For why else would it be called a Lemon if it couldn’t be defined by the very tang that makes lemons, lemons. Meyers are juicy – they exude juice, and juice that isn’t extracted with a lot of elbow grease either. My juice is perfect for ice-cream – I want its flavours to shine through in a canvas of creaminess and that’s one of the best decisions I’ve ever taken. My juice is perfect for lemon curd. Which is perfect stuffed into doughnuts. Let it be known though that each decision concerning a Meyer, any part of my Meyers has been carefully considered before being accepted or discarded for the potential joys or risks. 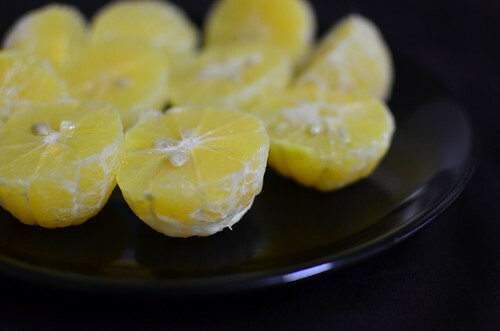 Since I learnt from one of my Meyer goddesses, Deepa of Paticheri…..that Meyer lemon seeds could be sprouted, I have saved lots of them, and attempted to sprout some. Post coming up. 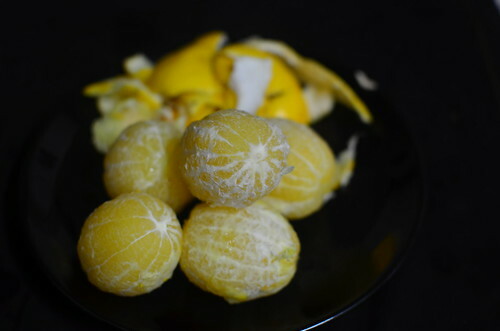 There you have it – the anatomy of my very favourite citrus. Go ahead, discover the Meyer – strip its skin, eat its flesh, let its juice drip down fingers, wrists and elbows.